This article presents modular recurrent neural network controllers for single legs of a biomimetic six-legged robot equipped with standard DC motors. Following arguments of Ekeberg et al. 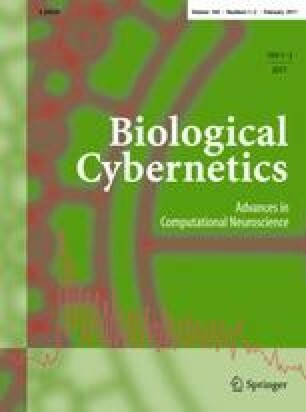 (Arthropod Struct Dev 33:287–300, 2004), completely decentralized and sensori-driven neuro-controllers were derived from neuro-biological data of stick-insects. Parameters of the controllers were either hand-tuned or optimized by an evolutionary algorithm. Employing identical controller structures, qualitatively similar behaviors were achieved for robot and for stick insect simulations. For a wide range of perturbing conditions, as for instance changing ground height or up- and downhill walking, swing as well as stance control were shown to be robust. Behavioral adaptations, like varying locomotion speeds, could be achieved by changes in neural parameters as well as by a mechanical coupling to the environment. To a large extent the simulated walking behavior matched biological data. For example, this was the case for body support force profiles and swing trajectories under varying ground heights. The results suggest that the single-leg controllers are suitable as modules for hexapod controllers, and they might therefore bridge morphological- and behavioral-based approaches to stick insect locomotion control. The online version of this article (doi: 10.1007/s00422-011-0422-1) contains supplementary material, which is available to authorized users.